Do you recognize this adorable little girl? She would grow up to be part of one of the biggest reality TV franchises on TV today, but back in 1991, she was just a cute tot, sitting on her mama’s lap! This gal is now a mama herself, and will soon be back on TV to do another season of her very popular reality show. 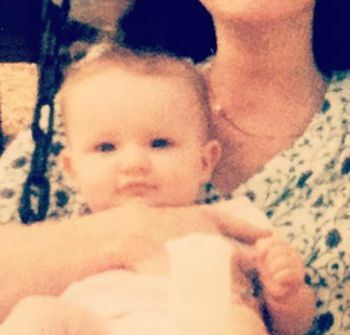 Can you guess who this little cutie grew up to be? Click below to find out! It’s Teen Mom OG star Maci Bookout! Maci, who is now a mom to three kids herself. Maci will soon be starring alongside Farrah Abraham, Amber Portwood and Catelynn Lowell on the sixth season of ‘Teen Mom OG,’ which premieres August 22 on MTV! To check out more photos of reality TV stars before they were famous, click here! It was very easy to tell who this was because there is such a strong resemblance to her son, Bentley. And, I agree, just one picture? Not enough to create an article worth printing. I think Jayde also looks a little bit like her momma. That’s it just one pic? BORING!!! !